Rental car Kos - an unforgettable experience! Greece and its beautiful islands, sometimes it is difficult to decide, because there are so many of them. 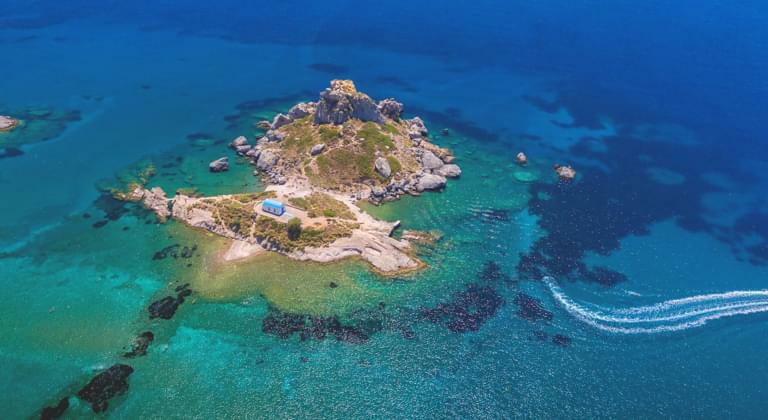 One of the 10 most beautiful islands here is Kos located in the Aegean Sea, which can become an unforgettable experience on a round trip with a rental car. The narrow, long island has about 20 km of beaches, many places of interest, beautiful scenic places and rustic Greek taverns, which are also offered here. Those who want to visit the beautiful island of Kos and are also interested in renting a rental car, should compare prices on the internet in advance of their trip in order to find a cheap rental car suited for their needs. Prices here can be vary a lot and a rental car could be much more expansive on site, than one, that was searched, compared and booked already before the journey favorably online on driveboo.com. The rental cars are then available for pick up where the holidaymaker wishes, for example at Kos airport or directly at the booked holiday destination. Especially when the accommodation is further away from Kos-City, it is a good idea to explore the island with a rental car and, first of all, to visit the old town of Kos-City. The island of Kos is also ideal for a round trip by rental car. The well-developed country roads lead the traveller from place to place and beach to beach. Of course you can join a guided tour group over the island of Kos at any time, but with your own rental car you are way more independent. The journey becomes more individual you are more flexible. Because on a round trip with a rental car over the beautiful island of Kos you can stop where you like and stay as long as you like. The capital is, as elsewhere in Greece and on the other islands, also the metropolis of Kos. Here in the old town, life takes place during the day and at night. If you have rented a rental car, you can drive to Kos-City at any time, no matter where your quiet accommodation at one of the many beautiful beaches is, and immerse yourself in the colourful life downtown. One can also dive into the Embros-Therme, directly located next to the open sea. This is a free use of a basin separated from the sea by stones, into which a spring with a temperature of about 50 degrees Celsius flows. The parking lot for the rental car is close by. After such a relaxation it is time for the travellers to return to the old town. Here you will find typical Greek taverns next to cafenios and ouzeries as well as small boutiques and other shops. The perfect place to stroll, buy souvenirs and stop for a drink, coffee or a Greek speciality. Not far away, about 4 km outside Kos-City, stand the foundation walls of a former sanatorium, the Asklepeion, which was built here around the 4th century BC. Asklepios was the god of healing in Greek mythology, was also mentioned by Homer and is said to have mastered medicine and surgery. In entire Greece you can still find such healing places, which were dedicated to the god of healing, just like in Kos. Kos-City can’t be explored on a single day, the traveller needs more time for this. If he or she booked a rental car cheaply on the Internet and rented it from a suitable car rental company before the trip started, the time would be no problem. That way you can easily combine sightseeing in and around Kos-City with the round trip over the island Kos and will have the option to visit the old town several times on different days. In the city itself, at the entrance to the old castle, stands the oldest tree in Europe, the plane tree of Hippocrates, which is said to be several hundred years old. According to myths, Hippocrates, the most famous doctor in Greece, is said to have already taught his students here under this plane tree, which would therefore be 2500 years old. As the tree becomes heavier and heavier with age, it must now be supported with scaffolding. A traveller who has booked a cheap rental car for the island of Kos is flexible and thus has the possibility to find an original Greek tavern with original Greek specialities far away from tourism. There is one such in the mountain village of Zia. Not only that here the holidaymaker is offered a gigantic view over the whole island and the Aegean. Also, the tavern Oromedon offers the food as it is cooked by the Greeks, and this has little to do with a Greek snack in Germany. Usually a cook in a Greek tavern asks his guests into the kitchen so that they can look into the pots and decide what they want to eat. An ouzo as an aperitif is usually included. After dinner you can visit the Kos National Park, which is a special experience for children. Small animal enclosures alternate with beds on which trees, plants and herbs grow. Between the trees are hammocks, in which the visitor may make himself comfortable. Meanwhile, the children can visit the adjoining playground. The one that was able to book a rental car before his vacation over a price comparison favorably on the Internet, has the possibility of visiting the many other, beautiful and worth seeing beaches directly from his accommodation on the island of Kos, or straight from the car rental. A different beach can be chosen daily for sunbathing and swimming in the sea. Surfers also get their satisfaction on the beaches of Kos. Here it is also up to each traveller whether he decides for a beach with fine sand or rather a pebble beach. Because both possibilities are available in Kos. You can also explore the beautiful beaches on the north coast with their villages Marmári, Mastichári or Tigáki. More nice beaches can be found in the area of Kos town. These offer beautiful long sandy beaches with shallow water, where the traveller can relax from his excursions with the rental car across the island. As typical for Greece, there are palm trees everywhere along the beaches, which convey a further holiday feeling. Further highlights in Marmári are "Erika´s Horse Farm" where you can swing on a horseback, as well as go to the Windsurfing Center, where even the layman is in good hands. The village of Mastichári, with its beautiful sandy beach where you can watch the sunset in the evening, is considered romantic, whereas Tigáki is a larger village with a well-attended beach. Nearby in the backcountry, a salt lake, which is almost dried out at the end of the year, can be explored by rental car. This way the different visible salt layers and a beautiful sight can be explored. Especially the flamingos that live here delight the heart of every nature lover. At the end of the day it is recommended to visit the tranquil restaurant Alikes Taverne in Tigáki, where the traveller can enjoy the typical Greek food at a moderate price. With a rental car in Kos, the traveller is above all: flexible. The different beaches here invite to different daily actions. Oone finds crystal clear water, fine sand and above all much peace and relaxation at the beach of the place Kefalos. The water is shallow, so this beach is also suitable for small children. Paradise Beach, which is also located on the south coast of the Kefalos peninsula, offers pure action and fun. Here the holidaymaker will find a wide range of activities on, in and by the water. The promenade is lined with many taverns, which, with their delicious food, invite you to linger after your visit to the beach. To sum it all up, a holiday on the beautiful sunny island of Kos with round trips in a rental car becomes an unforgettable experience.